New Delhi, Feb 27: The Supreme Court today asked the Centre to inform it within two weeks about the state of the Bill and other steps taken by it on the issue of relief and rehabilitation of the victims of women and child trafficking.A Bench headed by Chief Justice K G Balakrishnan granted time to the Ministry of Social Justice and Empowerment to apprise it about the draft Bill in this regard after it was told that the procedure was in progress.The Court was hearing a PIL filed by an NGO, Shakti Vahini in 2002 questioning the implementation of the ‘Plan of Action to Combat Trafficking and Commercial Sexual Exploitation of Women and Children.Various suggestions from NGOs and NHRC was taken on record by the court during the hearing.Senior advocate U U Lalit, who has been assisting the court as amicus curiae, in the matter has also put forward suggestions after thorough research and the court has asked the government to consider all those while preparing the draft Bill.Advocate S Wasim Quadri had informed the court that the Delhi Government concurs with the suggestions of the NHRC. LUCKNOW:WHEN the UP police needs information on traffickers, it has a trusted ally in Sunita.Her story is a familiar one in Nepal. Lured by prospects of a job, she travelled to Jammu and Kashmir, then to Himachal Pradesh and Mumbai where she was sold to a brothel. Months later, she was rescued and returned to Nepal. But then, she did not go back to the secure life she led in the Januka Bhatrai village in Morang district of Nepal. Bringing together several others who suffered the same ordeal, Sunita formed the Shakti Samuha which now works to rescue, counsel and rehabilitate women trafficked from Nepal. The UN Office on Drug and Crime is now considering taking their help in its work in the UP-Nepal border area. “We are looking forward to chalk out a strategy to combat trafficking at UP-Nepal border with the help of Samuha members,” Ajit Joy, project coordinator for Victim Support and Human Trafficking in UN office on Drug and Crime said. Started 10 years back with 15 girls rescued from trafficking, today Sunita has an all-girl brigade of 30 members – all in their 20s. Besides the field officer and an accountant, all members have been through the flesh trade racket in the region. “We hold regular meetings with the Uttar Pradesh police and share with them the vital information our members have since they themselves have been victims and are aware of the modus operandi of the traffickers,” said Sunita. Government records say that the 845 km border that UP shares with Nepal, there are at least 104 “cavities” that are used for trafficking. “In the past three years, more than 1,000 girls have been rescued from this porous border and about 100 men have been arrested for trafficking,” says Jata Shanker of Manav Sewa Sansthan which has been working against trafficking over the past 10 years. Talk about freeing a child from the shackles of labour and our State Government has just managed to balk at the prospect. The Chief Minister Buddhadeb Bhattacharjee and the State’s Labour Minister Mrinal Banerjee have recently written to the Central Labour Minister Oscar Fernandes and the Prime Minister Manmohan Singh, explaining their inability to free under-14 children from their jobs. As per the latest amendment to the Child Labour (Protection and Regulation Act (1986)—which came into force in October 2006—children who are employed in 15 hazardous industries including domestic sector and restaurants, kids must be freed from child labour and returned home. In the absence of a rehab policy for children, the State Government has stayed away from taking any action for eliminating child labour. “In many instances we have observed that forcing children to leave their jobs may not be advisable since many of the kids come from families where parents are either disabled or have no income. If we take these children out of their jobs, we will be forcing them to either become beggars or petty criminals”, minister of state for labour (West Bengal) Anadi Sau told Hindustan Times. Sau said that the new law may be forward-looking but the real enemy of child development is poverty. “So many factories have shut down all over the country. The Central Government has also stopped recruiting for so many of its departments. Unless the Central Government provides economic support for the poorer families, they will continue to send their children to work outside home”, pointed out Sau. The Labour department nevertheless is making an effort towards rehabilitating some of these rescued children but it is not enough. About 570 schools—each accommodating 50 child labour– have already been set up in 19 districts but the target is setting up 683 schools by 31st March, said Sau. “These kids get Rs 100 per month apart from free education and meals. The average cost comes to Rs 1000 per child”, said Sau. The Department of Social Welfare, Women and Child Development, which plays a supportive role to the Labour Department on issues like child labour, also feels that rehabilitation of the family is more important than rescuing the child from any job which he may be doing. “There are two schemes under the Central Ministry, the Integrated Street Children Programme and the Integrated Working Children Programme. Both these Central Government schemes are running but they are inadequate as rehab packages”, said S Nurul Haque, Secretary of the Department of Social Welfare, Women and Child Development. The State is now keeping its fingers crossed that the next five year plan may offer more largesse for children and their upkeep. PUNE, FEBRUARY 12 :State Director-General of Police P S Pasricha today said he had instructed all nine police commissionerates and 33 police districts in the state to prepare dossiers on missing children across Maharashtra in the wake of the Nithari killings. The DGP also spoke of increased trafficking of women in Maharashtra, especially Mumbai. “A special drive is being conducted by the social security branch of the police across the state to nab those engaged in the trade,” he said. He was speaking to the media on the sidelines of the 60th Foundation Day Celebrations of the State Wireless Department here. Asked about the steps taken by his office to curb the menace of missing children in the state being highlighted in a series by The Indian Express, Pasricha said, “A circular seeking the details of missing children has been sent to all police districts and commissionerates”. The Pune police has already begun a drive across the 20 police stations in the city, which reported 212 boys and 241 girls missing in 2006. The actual figure is 549 boys and 627 girls but the city police claims 337 boys and 386 girls were ‘recovered’ (returned home on their own or were traced by their parents and relatives). Pasricha appealed to parents and relatives of the missing children, who have returned home, to inform the police stations where they had registered the missing complaints. “Our experience shows that 90 per cent of the children return home but parents fail to inform the police about their return, which further compounds the problem,” he said. Saying both parents and teachers had a greater role to play, Pasricha advised them to sensitise themselves on issues related to their children. “There is need to create awareness about the issues affecting children. A simple thing like exam fever has made many children run away from their homes,” he said. NEW DELHI, FEBRUARY 12:Of the 15,000 who went missing from the Capital last year, 7,000 were minors — almost every second case brought to the police notice was that of a missing child. As it grapples with these cases and learns from the Nithari serial killings in neighbouring Noida and the conduct of the police there before the chilling discovery, the police in Delhi have started reworking priorities. Police Commissioner K K Paul has held more than one meeting on missing children and a circular has been issued to all units reminding them of the drill in such cases. Post-Nithari, a review of cases of missing children is taken up every Tuesday at a meeting Paul holds at the police headquarters. In addition to the existing missing persons cell, the police have nine new new cells on the job across the city. This too is post-Nithari. Joint Commissioners and Assistant Commissioners, who will be responsible for these cells in addition to their current assignments, have also been identified. Joint Commissioner (Crime) Ranjit Narayan says ‘‘the entire system has been streamlined further’’. 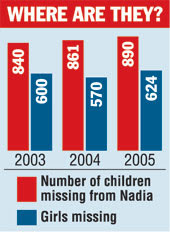 Delhi police say though figures for children gone missing are very high, so’s the recovery rate. Narayan says the 2006 recovery rate was a high 88 per cent. While police blame parents for not getting back to them, it’s also a fact that it’s not easy reporting a missing child and hoping the police swing into action immediately. Autorickshaw-driver Kundan Lal’s son Babloo disappeared from near their home on December 11, 2005. Bimla, the boy’s mother, says no one saw Babloo leave. As Kundan Lal was away, neighbours lodged a missing complaint at the Sangam Vihar police station. The next day, Kundan Lal went to the police station to lodge an FIR. 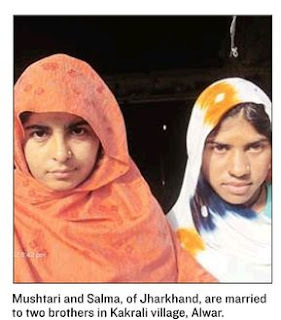 “They refused to lodge an FIR, telling me to look for my child first. I kept visiting the police station but they told me to trace my son,” he says. Many visits later, the police, says Kundan Lal, agreed to an FIR. “They asked me to arrange a vehicle for the policemen who would go in search of my son. I decided to take them in my auto.” For a week, Lal, who plies a rented autorickshaw, took the policemen wherever they asked him to. A week later, he couldn’t fund the rides anymore. Kundan Lal approached the National Human Rights Commission on January 25, 2006. Acting on his complaint, the NHRC wrote to DCP (South District) and DCP (Vigilance) asking them to submit an Action Taken Report within two weeks. Raipur, February 14 :• Days before Holi in 2003, 5-year-old Anju went missing while playing with friends outside her home. Ever since, Sushila and Anil Tandi, her parents, have been making daily rounds of the Khamardih police station. Sushila now doesn’t let her other two children out of sight. Anil has searched Nagpur, Bhopal, Gwalior, even Delhi but has had no luck. “Whenever I approach the police, they tell me, ‘Tumhari beti ko dhoondhne ke alawa aur koi kaam nahi hai kya hamare paas’ (Do you think we have no other work than to look for your daughter?)”. So whenever Anil manages to save money, he sets out in search of his daughter himself. • Six-year-old Sonia Rao went missing on August 14 last year while on her way home from school in Raipur.She was later found in Nagpur, where she had been sold by child-lifters within hours of her abduction. But it wasn’t the police who sniffed her out. Sonia’s mother, Sharda Rao, led a crowd from her colony to the Collectorate and police station for two days to mount pressure on the administration. “I was shattered but knew that if I didn’t act quickly chances of seeing my daughter again were slim.” The pressure tactics worked, teams went out and Sonia was traced to an orphanage in Nagpur where she had been kept by the Maharashtra Police. Three persons were arrested on charges of involvement in trafficking. It’s another matter that the Chhattisgarh Police learnt of Sonia’s return almost six days later. NGOs involved in women and child welfare estimate that only 10 per cent of kidnappings are registered with the police. Which means that the actual numbers could be much higher than the police figures of around 650 children missing during 2006 and about 620 in 2005. “As most complainants in tribal areas are illiterate, they cannot differentiate between lodging a complaint and a First Information Report. All that the police do is make a daily diary entry and issue the complainants non-cognisable receipts, telling them that a ‘case’ has been registered. Since an FIR adds to the crime statistics, the police tend to nip the trouble in the bud,” Anita Gupta, a social activist, alleged. According to the police themselves, there are gangs in the state that lift children to be sold to brothels in other towns. The recovery of Sonia was a case in point. Tehrunissa, Sheikh Maksood and Ramesh, members of an inter-state trafficking gang, were arrested for kidnapping and selling Sonia. They confessed during interrogation that they were active in Chhattisgarh for the past couple of years. “The accused used to abduct children from Raipur and sell them in the red light districts of Nagpur and in other cities,” a senior police officer said. Since the arrest of the three, police have also decided to increase their interaction with their counterparts in neighbouring states to check the trafficking. That may be an important step forward since there is no Chhattisgarh Police cell to deal with cases of missing children. The Chhattisgarh Police claims that its priority is the Naxal menace and child recovery isn’t high on their to-do list. This despite the Chhattisgarh Police circulating the Supreme Court guidelines on missing children, which directs the local police to act immediately in such cases. “Currently the local police has been entrusted with the job of locating missing children and we don’t think there is any need for a specialised cell to deal with the issue,” said Additional Director General of Police (CID) S K Paswan. He claimed that they were in the process of compiling the statistics and said the information would be available “shortly”. When The Indian Express tried to seek the version of DGP O P Rathor, he refused to speak on the issue, firmly saying that no data could be provided on missing children in Chhattisgarh. “I do not want a Nithari-like panic in my state,” Rathor retorted. Despite the constant reference to the chilling happenings at Nithari and the increasing incidences of crimes against children in Chhattisgarh, Home Minister Ram Vichar Netam also felt that there was no need for the creation of a separate cell to deal with such cases. “We need to understand that the local police is competent in handling the situation,” he said. CHENNAI, FEBRUARY 15 :• When E Kathirvel and Nagarani, pavement- dwellers in Pulianthope, woke up on an October morning in 1999, they found their 18 month-old son Sateesh missing. On May 3, 2005, police located the boy. But he had been legally adopted by the Bisessars, a Dutch couple, who had named him Anbu Rohit Bisessar and lived in Almere in the Netherlands. Sateesh spoke only Dutch. The police showed Nagarani a picture of the boy, pinned to a register of a Chennai-based adoption agency, Malaysian Social Service, which was being investigated. “We want him back,” said Nagarani. The police have sought the Centre’s help to bring back Nagarani’s child, now 9. Krishnagar, Feb. 6: Alarmed over increasing incidents of girl trafficking and awareness that many more might be going unreported, the Nadia administration has decided to find out the actual number of children to have gone missing over the past decade. The survey, to begin next month, will also try to find out how many of those missing were forced into flesh trade or bonded labour. This is the first time that such a database is being created, a district official said. “We are certain that the actual number of missing persons is higher than the number registered with police,” district magistrate .S. Meena said. Officials said a UNDP study had revealed that about 15 lakh girls had been trafficked from Bengal over the past 10 years. In Nadia, the figure could run up to nearly 300,000. The Telegraph had carried a series of reports on how girls were smuggled out of the state with the promise of a better life outside. “For a 12 or 14-year-old girl from a labourer’s family that lives on at best Rs 1,500 a month, the lure of a job in Mumbai or Delhi, which can fetch up to Rs 1,200 a month is too much to resist,” an official said. Once in a while, Bengal police go to Mumbai, Pune, Gujarat, Uttar Pradesh or Bihar to rescue them. “After rescuing these girls, we often realise that their parents had not even lodged a missing complaint. We want to get to the bottom of why such disappearances are not registered. The survey will help us bust the rackets that are in operation,” Meena said.